The sizable jump in consumer spending was up from a tiny 0.1% gain in August and was the best showing since an increase of 1.3% in August 2009, the Commerce Department reported Oct. 30. Income growth was also solid in September, rising by 0.4% as wages and salaries climbed. Consumer spending is closely monitored because it accounts for 70% of economic activity. The latest result suggests that Americans were feeling increasingly confident about the economy at the end of the third quarter. That should boost growth in the final three months of the year. The overall economy, as measured by the gross domestic product, grew at a solid 3% annual rate in the July-September quarter, despite the devastation from two hurricanes. It was the first time in three years the economy posted back-to-back quarterly gains of 3% or better. The big surge in spending in September was led by a 14.7% increase in spending for new motor vehicles, as drivers replaced the estimated more than 300,000 vehicles destroyed in the hurricanes. Consumer confidence has been bolstered by a Wall Street rally, which has pushed stocks to new highs. Economists said spending would get additional support next year if Republicans are able to push their tax cut package through Congress, and the cuts are made retroactive to the start of 2018. “Most households should get the benefit of a reduction in taxes early in the New Year, but we won’t know what proportion of households will be net beneficiaries of the Republicans’ tax cuts until the details of the plan are released this Wednesday,” said Paul Ashworth, chief U.S. economist for Capital Economics. A key inflation gauge closely followed by the Federal Reserve showed consumer prices rose 1.6% in September compared to a year ago, up from readings of just 1.4% the past three months. Fed officials, who have raised interest rates twice this year, will meet again on Oct. 31 and Nov. 1. However, analysts expect them to defer a third rate hike in an effort to ensure that low inflation is rising and annual price gains are again moving toward the Fed’s 2% target. The 1.6% 12-month rise in prices was the strongest gain since a 1.7% increase in April. Core inflation, which excludes food and energy, remained stuck at an increase of 1.3% over the past 12 months, the same as August. The 1% jump in consumer spending reflected a 3.2% advance in spending on durable goods such as autos. Auto sales were strong in September, posting the first monthly gain of the year. 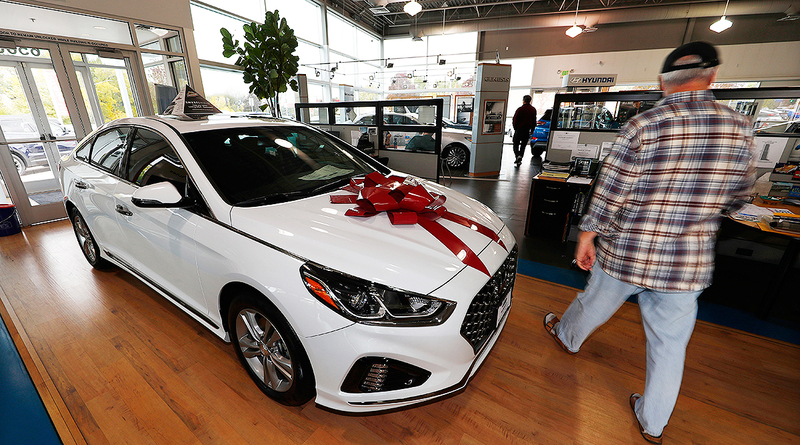 Analysts said sales were helped by purchases of replacement vehicles for cars damaged by the hurricanes that hit Texas and Florida. Sales of non-durable goods such as clothing posted a 1.5% rise, while spending on services such as utility bills and rent rose 0.5%. With spending so strong, the personal saving rate dropped to 3.1% of after-tax income, down from 3.6% in August.